BLACKWELL PUBLISHERS, 2003-04-30. Hardcover. Good. 2003-06-04. New. Ships with Tracking Number! INTERNATIONAL WORLDWIDE Shipping available. Buy with confidence, excellent customer service! 1991-09-02. New. Ships with Tracking Number! INTERNATIONAL WORLDWIDE Shipping available. Buy with confidence, excellent customer service! 2014-03-17. New. Ships with Tracking Number! INTERNATIONAL WORLDWIDE Shipping available. Buy with confidence, excellent customer service! Polity, 1991-09-02. 1. Paperback. Used:Good. Polity, 2003-06-12. 3. Paperback. Used:Good. Polity, 2014. Paperback. New. 9.7 x 7.45 cm. 2014-03-17. Good. Ships with Tracking Number! INTERNATIONAL WORLDWIDE Shipping available. May not contain Access Codes or Supplements. May be ex-library. Shipping & Handling by region. Buy with confidence, excellent customer service! 2003-06-04. Good. Ships with Tracking Number! INTERNATIONAL WORLDWIDE Shipping available. May not contain Access Codes or Supplements. May be ex-library. Shipping & Handling by region. Buy with confidence, excellent customer service! Cambridge: Polity Press. Very Good+; Light cover creasing. ; Very heavy book and priced . accordingly. Nice tight copy, no names or marks inside.. 1996. Paperback. Trade PB . 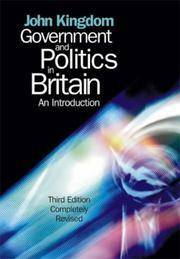 Sixth Printing; B&W Illustrations, tables and charts; 651 pages; An introductory text on British politics for A level students and undergraduates. ; 0745605931 . Condition: Very Good+; Light cover creasing. ; Very heavy book and priced accordingly. Nice tight copy, no names or marks inside. Polity. PAPERBACK. 0745638899 Brand New ,Original Book , Direct from Source , Express 5-8 Business days worldwide Delivery. . New. Polity. PAPERBACK. 0745638899 Brand New! Fast Shipping! Free USPS Tracking Number. Excellent Customer Service! . New. Polity Press, 1999. This is an ex-library book and may have the usual library/used-book markings inside.This book has soft covers. In good all round condition. Polity Press, 1996. This book has soft covers. Ex-library, With usual stamps and markings, In fair condition, suitable as a study copy. Polity. PAPERBACK. 0745625940 . Good. Polity Pr, 1991-07-01. Hardcover. Good. Polity. PAPERBACK. 0745638899 . Very Good. Polity. Used - Good. Former Library book. Shows some signs of wear, and may have some markings on the inside. Polity. Used - Very Good. Former Library book. Great condition for a used book! Minimal wear. Cambridge: Polity. Lightly creased corners, else a crisp and tight copy. . Very Good. Soft cover. Reprint. 1992. Polity Press, 1991-07. Paperback. Good. Polity Press. PAPERBACK. 0745617204 . Very Good. Polity Press, 06/25/1999. Paperback. Used; Good. **WE SHIP WITHIN 24 HRS FROM LONDON, UK, 98% OF OUR ORDERS ARE RECEIVED WITHIN 7-10 DAYS. We believe you will be completely satisfied with our quick and reliable service. All orders are dispatched as swiftly as possible! Buy with confidence! Polity Press, 05/09/1991. Paperback. Used; Good. **WE SHIP WITHIN 24 HRS FROM LONDON, UK, 98% OF OUR ORDERS ARE RECEIVED WITHIN 7-10 DAYS. We believe you will be completely satisfied with our quick and reliable service. All orders are dispatched as swiftly as possible! Buy with confidence! Jan 01, 1996. Paperback. Fair. cover creased.Offered by the U.K. charity Langdon: supporting young men and women with disabilities. Polity. Used - Good. Light scratches on cover. Ships from UK in 48 hours or less (usually same day). Your purchase helps support the African Children's Educational Trust (A-CET). Ex-library, so some stamps and wear, but in good overall condition. 100% money back guarantee. We are a world class secondhand bookstore based in Hertfordshire, United Kingdom and specialize in high quality textbooks across an enormous variety of subjects. We aim to provide a vast range of textbooks, rare and collectible books at a great price. Through our work with A-CET we have helped give hundreds of young people in Africa the vital chance to get an education. We provide a 100% money back guarantee and are dedicated to providing our customers with the highest standards of service in the bookselling industry. Polity. PAPERBACK. 0745625940 . Very Good. Polity. Used - Very Good. Ships from the UK. Former Library book. Great condition for a used book! Minimal wear. 100% Money Back Guarantee. Your purchase also supports literacy charities. Polity. Used - Good. Ships from the UK. Shows some signs of wear, and may have some markings on the inside. 100% Money Back Guarantee. Your purchase also supports literacy charities. Polity. PAPERBACK. 0745605931 ref 791 d . Good. 1991. Polity Press, 1996. This is an ex-library book and may have the usual library/used-book markings inside.This book has soft covers. In fair condition, suitable as a study copy.